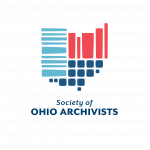 The Society of Ohio Archivists Merit Award is given to individuals or organizations that have by excellence in deeds, actions, or initiatives improved the state of archives in Ohio over the past year. The awards will be announced at the annual spring meeting on Friday, May 17, 2019 at the Hilton Akron/Fairlawn Hotel (http://www.akronhilton.com/). 1. This award shall be given to individuals or organizations that have by excellence in deeds, actions, or initiatives improved the state of archives in Ohio over the past year. 2. The Merit Awards shall not be limited to any one scope of endeavor that benefits the work of archivists in Ohio or limited in the number of awards that may be presented each year. 3. The sole criteria for this award shall be excellence in the furtherance of the purposes of SOA as stated in part 2 of its Constitution and Bylaws in any manner considered appropriate by the council of the Society of Ohio Archivists. 4. Council will encourage the membership of SOA to nominate individuals for the Merit Awards and these nominations will be the basis for the council’s action in designating recipients. Applications are due by February 25, 2019. Applications and inquiries can be sent via e-mail or mail to Devhra BennettJones, Devhra@Lloydlibrary.org, Lloyd Library, 917 Plum Street, Cincinnati, Ohio 45202. 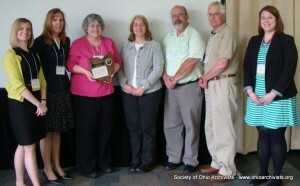 The award will be presented at the Society of Ohio Archivists Annual meeting on Friday, May 17, 2019 at the Hilton Akron/Fairlawn Hotel (http://www.akronhilton.com/). 2018: Lae’l Hughes-Watkins, University Archivist at Kent State University, is honored for her development and leadership of Project STAND (Student Activism Now Documented), a ground-breaking collaborative effort among academic archives whose online collections portal documents student activism related to historically marginalized communities. The recent uptick in activism on college campuses means that archivists must consider their role in preserving and providing access to records underscoring these narratives, while transient student populations and at-risk records lend an urgency to the work. Lae’l has worked tirelessly to recruit participants, communicate with members, manage volunteers, and foster conversations about responsible collecting. Originally intended to highlight student activism in Ohio, Project STAND now includes more than 40 institutions nationwide and continues to grow. Through Lae’l’s leadership and vision, the activism of African American, Latinx, LGBTQ, religious minorities, disabled, and other historically marginalized communities will be preserved and given the attention it deserves. For her efforts in leading Project STAND, it is fitting that the Society of Ohio Archivists presents Lae’l Hughes-Watkins with the 2018 SOA Merit Award. 2017: The Greene County Records Center & Archives, located in Xenia, Ohio, was honored with one of this year’s Society of Ohio Archivists Merit Awards. The Records Center & Archives maintains and preserves the vital historical records of Greene County. One of its responsibilities is to ensure that those records remain accessible and of interest to future generations. Seeing the classroom as the best place to accomplish these goals, the GCRCA embarked on a project to bring primary sources to the Greene County classrooms. The goal of the project was to introduce students to the importance of archival repositories, their role in preserving important records and how those records can be used for a variety of research projects. Additionally, the program allowed the archive to educate students about the rich history of the county in which they live. In addition to numerous classroom visits, the project saw the completion of a variety of educational materials for students and/or educators. These materials included booklets on 1) What does an Archivist Do? ; 2) What is an Archives? ; 3) What is a Record? ; 4) Maps for Kids; 5) Biographies for Kids; 6) Genealogy for Kids; 7) a Greene County historical coloring book; and 8) Crossword and Word Search puzzles. Each of these booklets and activities are now available for download on the GCRCA’s website and showcase specific records housed in the repository. 2016: Margaret Burzynski-Bays, Archivist at University Hospitals of Cleveland, is honored for her exemplary service to the archival profession. 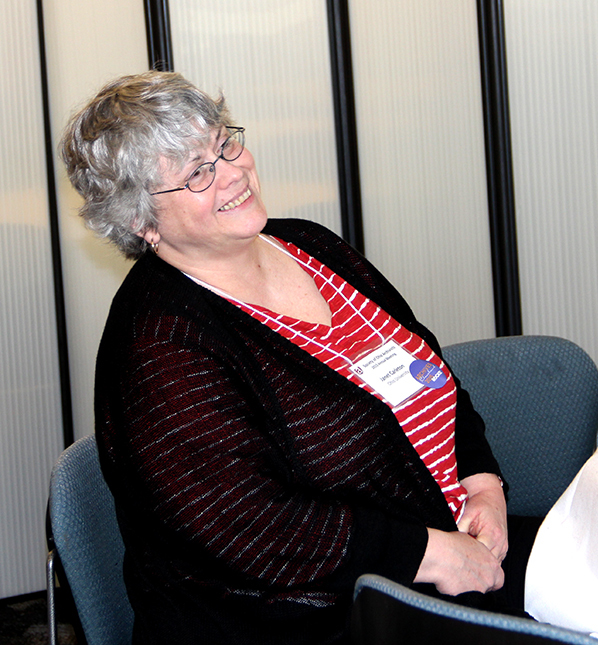 Margaret has served as an advocate, leader, mentor, and friend to many an archivist in the state of Ohio. At the Western Reserve Historical Society, Margaret served in many capacities developing collections, creating a useful grants database, documenting history with model preservation projects, streamlining archival policies & procedures, advocating for archives within the institution & community, and improving access to archival materials. She contributes to the growth of the archival profession by serving on the Steering Committee of the Cleveland Archival Roundtable and by going above and beyond to mentor and assist students and young professionals in the field. For her steadfast devotion to the archival profession, it is fitting that the Society of Ohio Archivists presents Margaret Burzynski-Bays with a 2016 SOA Merit Award. 2015: Janet Carleton, Digital Initiatives Coordinator at Ohio University Libraries, is honored for her exemplary service to the Society of Ohio Archivists. Janet’s strong commitment to SOA and archives is demonstrated by her tireless efforts such as her extensive service on a number of SOA committees including the Public Information/Website Committee, Archives Week and Local Arrangements. Most importantly, Janet has served as editor of the Ohio Archivist newsletter from 2012 to 2014. She has reinvigorated the newsletter, bringing on numerous new writers and contributors to provide substantial content of strong interest to the archival community. She has established a new model for the newsletter which will ensure its continued strength and longevity. Janet works tirelessly to promote archives, digitization, and libraries, through her work with professional organizations including OhioDIG, Midwest Archives Conference, Society of American Archivists, and the Society of Ohio Archivists. For her steadfast devotion to Society of Ohio Archivists and the archival profession, it is fitting that the Society of Ohio Archivists presents Janet Carleton with a 2015 SOA Merit Award. 2015: Gillian Marsham Hill, of Greene County, Ohio, is honored for her exemplary service to the archival profession. Gillian has served as an advocate, teacher, leader, mentor, and friend to many an archivist in the state of Ohio. As the Records and Information Manager and Archivist for Greene County, Gillian built a county records management program that would go on to set the standard for archives across the region. She has tirelessly advocated for the importance of archives and in particular, local government records. She was a founding member of the Miami Valley Archivists Roundtable and the Ohio County Archivists and Records Managers Association as well as a long-term member of the Society of Ohio Archivists and the Greater Dayton Chapter of ARMA. For her steadfast devotion to the archival profession, it is fitting that the Society of Ohio Archivists presents Gillian Marsham Hill with a 2015 SOA Merit Award. SOA President Judith Wiener presents the Merit Award to the Sandusky Library with Ron Davidson accepting on the library’s behalf. On right is Jillian Carney Council Liaison to the Awards Committee. 2014: The Sandusky Library is honored for the innovative documentary “Under the Baton: Music at Old Cedar Point.” The project is an excellent illustration of how archival materials can be not just stored in an archive, but actively used to create original content that highlights the primary resources it contains, promotes the materials and the archives, builds a sense of enthusiasm, and creates community around a shared history. Through the development of strong partnerships with other area institutions, the Sandusky Library was able to showcase the complete history of the music of Cedar Point. Along with the documentary, the Sandusky Library’s efforts had a broader impact through the development of lesson plans, based on the State of Ohio Social Studies Academic Content Standards, for K-12 classrooms, and library programs focusing on various aspects of Sandusky and Cedar Point history. Between the distribution to Erie County schools, CLEVNET libraries, and airing on WGTE, “Under the Baton” is accessible to tens of thousands of people, many of whom are Cedar Point aficionados who will no doubt enjoy a new perspective on this beloved local landmark. For its innovative programming, it is fitting that the Society of Ohio Archivists presents the Sandusky Library with a 2014 SOA Merit Award. 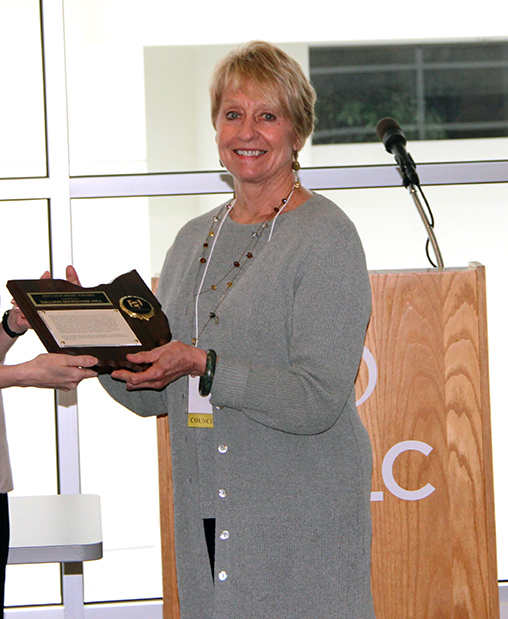 SOA President Judith Wiener presenting Merit Award to OHRAB member Janet Carleton, accepting on behalf of the Ohio Historical Records Advisory Board, May 21, 2014. Others in photo are past or present OHRAB members (Laurie Gemmill Arp, Carleton, Dawne Dewey, Ron Davidson, George Bain). At right is Jillian Carney, OHS staff member who facilitates the board’s work and Council liaison to the Awards Committee. 2014: The Ohio Historical Records Advisory Board (OHRAB) is honored for its work in supporting, improving, and advocating for archives in Ohio. It is the mission of OHRAB to serve the people of Ohio by advocating, nurturing, and advising programs that identify, preserve, and provide access to their documentary heritage, which enriches the culture and protects the rights of Ohioans. Through the Ohio Archives Grant program sponsored by OHRAB more than 40 record centers and archives have received funding to organize, preserve, catalog, and digitize records for improved access. Since 2010 OHRAB has recognized significant accomplishments in preserving and improving access to historical records in any format by Ohio archival institutions through the Achievement Award program, as well as Ohio students’ use of primary sources in research and scholarship at National History Day in Ohio. For its continued leadership and support of Ohio’s archives, as demonstrated above, it is fitting that the Society of Ohio Archivists presents the Ohio Historical Records Advisory Board with a 2014 SOA Merit Award. 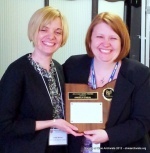 2013: Jane S. Wildermuth, head of Digital Services at the Wright State University Dunbar Library, is given this merit award in recognition of her years of exemplary service to the Society of Ohio Archivists. Jane has led the Society’s Public Information Committee, Nomination Committee, Spring Meeting Local Arrangement Committee, and has served as past SOA Treasurer and President. Her work on the Program Committee led to record numbers of attendees for the spring meeting. Overall, Jane’s leadership and vision created a strong foundation for the Society to grow to what it is today. For her never-ending energy and devotion to SOA and the archival profession in general, it is fitting that the Society of Ohio Archivists presents Jane S. Wildermuth with a 2013 SOA Merit Award. 2012: William C. Barrow, Special Collections librarian at Cleveland State University (CSU), is honored in recognition of his efforts in founding and directing the Cleveland Memory and Ohioâs Heritage Northeast Projects. Together with the hard work and dedication of numerous colleagues and volunteers, the projects have flourished and provided a rich portal of the areaâs heritage. Preceded by the Cleveland Digital Library, the Cleveland Memory Project features a trove of rich documentation that links an array of collections and subject topics from across the Cleveland metropolitan area. Through its leadership in this field regionally, the CSU Library has also provided the server for a broad Ohioâs Heritage Northeast platform that links universities, colleges, and a number of public libraries with historical photographs. For his on-going leadership of and involvement with these inspiring programs, it is fitting that the Society of Ohio Archivists presents Bill Barrow with a 2012 SOA Merit Award. 2012: Angela O’Neal, director of Collections Services at Ohio Historical Society (OHS), is honored in recognition of her outstanding service to the Society of Ohio Archivists and promoting archives within Ohio. Angela served as SOA vice president 2005-2007 and president 2007-2009. She also served as either program chair or co-chair of many annual meetings, fall seminars, and joint meetings (most notably with MAC in 2007) from 2005 to 2009. An employee of OHS since 2000, O’Neal has continually expanded and moved to increasingly innovative ways for promoting archives and involving the end user, and especially doing more with less. For her energy and devotion to SOA and archives in general, it is fitting that the Society of Ohio Archivists presents Angela O’Neal with a 2012 SOA Merit Award. 2011: The Intermuseum Conservation Association (ICA) provides outstanding services to the archival, library and museum professionals and institutions in the state of Ohio as well as to its citizens. ICA’s efforts to provide guidance and education for the preservation of Ohio’s documents and artifacts is innovatively achieved through the use of electronic resources, workshops and tours for all interested in preservation and history. 2009: The Margaret Clark Morgan Foundation: Since 2003, The Margaret Clark Morgan Foundation (MCMF) has contributed $2.5 million to support the Archives of the History of American Psychology (AHAP) at the University of Akron. The Foundation has provided stipends for the archives to hire graduate students to arrange, describe and make accessible unprocessed manuscript collections involving the history of mental health research and practice. The Foundation also provided the archives with funding for a web developer to maintain and update databases and the archives website. To date, fourteen AHAP collections totaling 226 linear feet have been organized, cataloged and cross-referenced in a database making the AHAP one of the leading resources for psychological testing material in the country. In May 2006, MCMF provided the archives with a leadership gift to complete the design development study of the future home of the AHAP. In June 2007, the Foundation further signaled its commitment by establishing the Endowed Directorship for the AHAP with a $2.1 million gift, the largest gift ever given to the AHAP. 2009: The EAD Task Force, composed of nine professionals from Ohio institutions and OhioLINK, collaborated to develop a viable and effective tool that greatly simplifies preparation of EAD documents across a multi-institutional environment. Over the past three years, the Task Force created a specification template, monitored enhancement requests, customized a software tool kit, and provided training workshops for archivists, librarians, students, and other professionals all across the state of Ohio. All current and past members of the Task Force are being recognized for their contributions to our profession. The EAD Task Force consists of: Janet Carleton, Ohio University; David Gaj, Kent State University; Cara Gilgenbach (chair), Kent State University; Beth Kattelman, Ohio State University; Amy McCrory, Ohio State University; Rhonda Rhinehart, University of Akron; Meg Spernoga, OhioLINK; Toni Vanden Bos, Wright State University; Sheila Yeh, OhioLINK. 2008: Roland Baumann: From the summer of 2005 to August 2007 Oberlin College Archivist Roland Baumann raised approximately $530,000 for the Richard and Priscilla Stevenson Hunt endowed Fund for Preservation and Digital Access. The campaign received over 660 donations, including several large contributions and 175 multiple gifts from individuals. Baumann’s efforts have provided the financial resources for the Oberlin College Archives to manage and make accessible its digital images and improve the preservation of the holdings of the Oberlin College Archives. In the process one donor made a special bequest to establish the Smith-Posey Endowed Fund for Archival Advocacy. It is critical to note that Baumann conducted and successfully completed the scheduled three-year campaign in little over two years. His success was due to the many important contacts and relationships developed over his twenty years as archivist of Oberlin College. His success in the fundraising campaign for the Hunt Endowed Fund should be an inspiration to all archivists who seek to further their programs through support of friends and users of archives. 2007: Barbara Floyd: for her collaborative groundbreaking work in developing a new field of scholarship–disability history. 2007: State Representative W. Scott Oelslager: for his commitment to public records, his passion for history, and his work to secure the passage of House Bill 9, which clarifies procedures for public records requests and requires training for local elected officials. 2007: Robert Schmidt: for his work as coordinator of the Archives and Archivists List from 1998-2006. 2006: Anna Heran: in recognition of her yeoman service as chair of SOA’s Education Committee. 2006: Judy Cobb: in recognition of her outstanding work in the transition of the Ohio Archivist to an online publication during her five years as editor. 2006: Mark Leff: in recognition of his outstanding use of archival materials in broadcast journalism. 2004: Dawne E. Dewey: The Society of Ohio Archivists considers it a great honor to recognize one of Ohio’s leading archival ambassadors, Dawne E. Dewey. Ms. Dewey has traveled internationally, served as an expert for national media outlets such as National Public Radio and the Discovery Channel, made countless presentations about the Wright family throughout the Miami Valley and beyond, and managed many local events commemorating the Centennial of Flight. She has continually brought honor to the Special Collections & Archives and the Paul Laurence Dunbar Library at the Wright State University. Ms. Dewey has also served the Ohio archival community as SOA President, Vice-President, Council member, and as a member of the Local Arrangements, Nominating, Program, Merit, and Archives Week Committees. The Society takes great pleasure in bestowing its Merit Award upon Dawne E. Dewey for her tireless devotion during the anniversary of the centennial of powered flight and for her dedication to the archival community. 2004: Dr. Jacob Rader Marcus: The Society of Ohio Archivists considers it a great honor to posthumously recognize a great archival educator and activist, Dr. Jacob Rader Marcus (1896-1995). Dr. Marcus made an enduring and ongoing contribution to archival work in Ohio. A rabbi, scholar, and professor of American Jewish history at the Hebrew Union College Jewish Institute of Religion for 75 years, he founded the American Jewish Archives in 1947. As director of the American Jewish Archives for nearly 50 years, Dr. Marcus assured the preservation of the records of more than 30 Jewish communities in Ohio. In addition, through outreach and education initiatives he urged Jewish communities throughout Ohio to preserve and document their own local history. The Society takes great pleasure in bestowing its Merit Award upon the namesake of the Jacob Rader Marcus Center of the American Jewish Archives, Dr. Jacob Rader Marcus. 2003: Laurie Gemmill: In recognition of her dedication, professionalism, leadership, and service, as evidenced by the ongoing success of the Ohio Memory Project and development of the Society of Ohio Archivists web presence; SOA takes great pleasure in awarding Laurie Gemmill its Merit Award. As SOA webmaster, Laurie worked diligently to update and establish the SOA website as the primary information resource for the organization, moving SOA into the digital age. In her work on the Ohio Memory Project, Laurie has displayed steadfast leadership and creative vision for a much-needed project that has introduced Ohioâs historical treasures to the public and has established an exemplary model for other digital projects throughout the state. SOA applauds Laurie Gemmill for her tireless efforts on behalf of Ohio’s archival community. 2003: Ruth Helmuth: As the Society of Ohio Archivists observes the 35th anniversary of its founding, it takes the opportunity to recognize in a retrospective fashion the signal achievement of one of its founders, the late Ruth Helmuth, for the important contributions to the archival field in Ohio through service with the Case Western Reserve University. But the work of founding SOA has itself resulted in an impressive state-level group that has contributed to the archival community in the state, across the nation, and even abroad. It is especially fitting for SOA, on this occasion of the celebration of its 35th anniversary, to express heartfelt gratitude to one of its primary founders, Ruth Helmuth, on April 10, 2003. 2003: David Larson: As the Society of Ohio Archivists observes the 35th anniversary of its founding, it takes the opportunity to recognize in a retrospective fashion the signal achievement of one of its founders, David Larson, for the important contributions to the archival field in Ohio through service with the Ohio Historical Records Advisory Board. But the work of founding SOA, serving as President, and editor of “The Ohio Archivist” has itself resulted in an impressive state-level group that has contributed to the archival community in the state, across the nation, and even abroad. It is especially fitting for SOA, on this occasion of the celebration of its 35th anniversary, to express heartfelt gratitude to one of its primary founders, David Larson, on April 10, 2003. 2003: Jean R. Mahn: As the Society of Ohio Archivists observes the 35th anniversary of its founding, it takes the opportunity to recognize Jean R. Mahn for her outstanding interest in and concern for archives and archival interests in Ohio. She has been involved in philanthropic activities throughout her life. In 1989 the Mahns married and spent five years in Canada before returning to Athens, Ohio. On October 15, 2002, Jean and her husband announced a $1 million gift to support the establishment of the Robert E. and Jean R. Mahn Center for Archives and Special Collections at Ohio University. It is especially fitting for SOA, on the occasion of its 35th anniversary, to express its heartfelt gratitude to Jean R. Mahn on April 10, 2003. 2003: Robert E. Mahn: As the Society of Ohio Archivists observes the 35th anniversary of its founding, it takes the opportunity to recognize Robert E. Mahn for his contributions to the archival field in Ohio. Mahn served Ohio University for 51 years, filling a variety of posts under seven presidents including University Archivist and Records Officer from 1967 to 1972. As Assistant to the President and Secretary to the Board of Trustees he often visited the archives to research issues for the President and the Board. On October 15, 2002, Mahn and his wife announced a $1 million gift to support the establishment of the Robert E. and Jean R. Mahn Center for Archives and Special Collections at Ohio University. It is especially fitting for SOA, on the occasion of its 35th anniversary, to express its heartfelt gratitude to Robert E. Mahn on April 10, 2003. 2003: Kermit Pike: As the Society of Ohio Archivists observes the 35th anniversary of its founding, it takes the opportunity to recognize in a retrospective fashion the signal achievement of one of its founders, Kermit Pike, for the work he performed in starting the Society and serving as President and editor of âThe Ohio Archivist.â Pike has made other important contributions to the archival field in Ohio, especially in northeastern Ohio through service with the Western Reserve Historical Society in its efforts to collect recent materials from ethnic groups. But the work of founding SOA has itself resulted in an impressive state-level group that has contributed to the archival community in the state, across the nation, and even abroad. It is especially fitting for SOA, on this occasion of the celebration of its 35th anniversary, to express heartfelt gratitude to one of its primary founders, Kermit Pike, on April 10, 2003. 2001: Martin Hauserman: in recognition of his dedication and service as archivist of the Cleveland City Council, SOA takes great pleasure in awarding Martin Hauserman its Merit Award. Martin worked tirelessly to save, preserve, and make available a rich collection of architectural records and photographs documenting the history of the city of Cleveland. His efforts to preserve this historically valuable record included imaginative publicity and outreach to increase awareness and concern for Cleveland’s heritage. Martin recruited knowledgeable volunteers to identify, conserve, and use these records. Martin, known as “the man who saved Cleveland history”, is very deserving of SOA’s Merit Award. SOA applauds Martin Hauserman for his efforts on behalf of Ohio’s archival community. 2001: Madeline “Mitch” Helms: in recognition of her dedication and service to the Society of Ohio Archivists in the production of the Ohio Archivist, SOA takes great pleasure in awarding Mitch Helms its Merit Award. Mitch’s expertise and creativity in the field of publishing, design, and editing has transformed the Ohio Archivist into an outstanding publication. Mitch demonstrates commitment to the archival community in Ohio through her membership in SOA and in her service to the membership through the production of our membership directory and the countless ways in which she assists SOA Council and members. 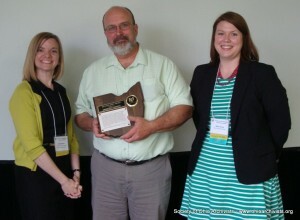 It is with great appreciation that SOA presents this Merit Award to Mitch Helms on behalf of Ohio’s archival community. 2001: Diana Marchese: in recognition of her continuing interest and enthusiasm in promoting Archives Week in Ohio, SOA takes great pleasure in awarding Diana Marchese its Merit Award. As Trumbull County Recorder, Diana has been tireless in her efforts to promote and celebrate Archives Week in Ohio through special events in her county. Diana has shown extraordinary support for Archives Week in her capacity as a public official. SOA applauds Diana Marchese for her efforts on behalf of Ohio’s archival community. 2000: Kenneth Grossi: in recognition of his service of more than a decade, SOA takes great pleasure in awarding Ken Grossi its Merit Award. Ken exemplifies the qualities of quiet confidence, steady leadership, and unshakable patience to which all professional archivists should aspire. During his distinguished service as an officer of SOA he helped build a solid financial base for the organization, contributed to educational efforts for both professional and amateur archivists, and promoted the archival profession in Ohio. Ken Grossi’s work in SOA has given the organization the means with which to face the challenges of the new millennium. SOA applauds Kenneth Grossi for his efforts on behalf of Ohio’s archival community. 1999: Margaret Theibert and Donna Oxenrider: in recognition of their outstanding accomplishments in the preservation of public records in Ohio. Their invaluable contributions to electronic records initiatives in Ohio have helped archivists overcome a myriad of technological challenges. Their valiant efforts assure that the State Archives of Ohio will contain a record of government actions and responsibilities, better enabling Ohioans to defend their rights and maintain their liberties. The work of Margaret Theibert and Donna Oxenrider has ensured the citizen’s of Ohio continued access to authentic public records. SOA applauds Margaret Theibert and Donna Oxenrider for their efforts on behalf of Ohio’s archival community. 1998: George Parkinson: in recognition of his service on the Council of the Society of Ohio Archivists, for his willingness to dedicate facilities and staff of the Ohio Historical Society to enable SOA to carry out its mission and goals, and for his efforts to promote the preservation of and access to historical records through the Ohio Historical Records Advisory Board and The Ohio 2003 Plan. SOA applauds George Parkinson for his efforts on behalf of Ohio’s archival community. 1997: Raimund Goerler: in recognition of his excellent work as both advocate and archivist of the Admiral Byrd Papers, for his initiative and leadership in establishing an electronic records program for Ohio’s higher education, and in honor of his years as dedicated service as historian of the Society of Ohio Archivists and caretaker of the Society Archives. 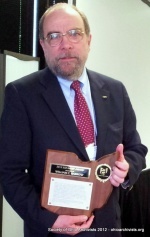 SOA applauds Raimund Goerler for his efforts on behalf of Ohio’s archival community. David Van Tassel: in recognition of his dedication and enthusiasm in promoting the study of history through the founding of National History Day in Ohio and for his encouragement and support of the use of primary sources and archival repositories in research and writing by students in our schools. SOA applauds David Van Tassel for his efforts on behalf of Ohio’s archival community. 1996: Charles Arp: in recognition of his contributions to the SOA education program, strategic planning initiative, annual meetings, and numerous other creative activities on behalf of the society. 1996: Mary Bowman: in recognition of enthusiastic support of archival work as president of the Ohio Genealogical Society. A genealogist, historian, author, teacher, and volunteer archivist, Mary’s impact on the Ohio scene is appreciated by everyone who believes that the past informs and immeasurably enriches the present. 1996: Frederick Lautzenheiser: in recognition of his diligence, dedication, and skill in making The Ohio Archivist an outstanding newsletter and for his initiative and caring attitude in providing the Cuban archivists with materials and resources to further their archival program. 1996: Julie Overton: in recognition of her unfailing enthusiasm and dedication in serving Ohio’s genealogists and other researchers of Ohio’s history, and for being an ambassador of good relations between the archival profession and related disciplines. SOA applauds Julie Overton for her efforts on behalf of Ohio’s archival community. 1995: Mary Noonan: in recognition of her pioneering efforts as Director of the Inter-University Council to preserve the records of Ohio colleges and universities so that future generations of students and scholars will know the history of our times. 1994: Richard W. Gross: in recognition of his extraordinary efforts in recovering Civil War documents stolen from the Cincinnati Historical Society. 1994: Nancy Johnston: in recognition of her dedication, perseverance, and enlightened leadership in chairing the Attorney General’s Open Records Task Force, 1992-1993. 1994: George W. Bain: in recognition of his initiative, enthusiasm, and tireless efforts in developing and implementing Archives Week in Ohio.